Valor Ambulance Service, LLC was established in 2009. We specialize in local and long distance non-emergency and emergency transportation. All staff members are highly trained and experienced. 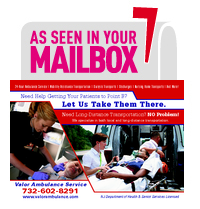 Valor Ambulance Service is Fully Licensed and Insured. We provide competitive and efficient options in medical transportation. We will make every effort to address your concerns and customize a service plan that will accommodate your particular needs. Call us today to speak with a Representative to customize a transportation plan that works for you! We are now accepting new dialysis patients!